Walk n’ Roll was the official kickoff to the 125th anniversary yearlong celebration, with the “Hats Off” theme. To say “Hats Off,” over 2,200 kids, parents, community members, and hospital staff showed their support for the programs and care provided by Children’s Specialized Hospital by raising over $300,000. New Brunswick, New Jersey: This year marks Children’s Specialized Hospital’s 125th anniversary of helping children with special healthcare needs reach their fullest potential. To commemorate the anniversary, the hospital has themed the milestone “Hats Off” and kicked off the yearlong celebration at the 10th annual Walk n’ Roll for Children’s Specialized Hospital Foundation on Saturday, May 21, at Johnson Park in Piscataway, New Jersey. “Hats Off” is a unique way to show appreciation to early founders, supporters, physicians, and dedicated staff members who have helped Children’s Specialized Hospital grow to meet the demanding needs of children recovering from traumatic brain and spinal cord injuries, or to treat the thousands of children on the autism spectrum and those with complex medical needs. Visit the special website dedicated to the 125th anniversary. This popular community event attracted hundreds of families who have benefited from the programs at Children’s Specialized Hospital and enables them to give back to the organization that has partnered with them to help their child reach their fullest potential. Each year, Children’s Specialized Hospital treats nearly 29,000 patients from birth to age 21 with special healthcare needs at 13 locations across New Jersey. 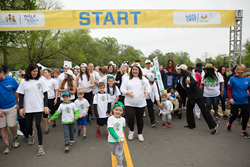 Open to all members of the public, the 2016 Children’s Specialized Hospital Walk n’ Roll took place Saturday, May 21, at Johnson Park in Piscataway, New Jersey. Over 1,100 walkers were pre-registered and many wore their own crazy hats to commemorate the 125th anniversary. Everyone stayed for the free kids’ carnival with food, games, prizes and fun! Walk n’ roll chairwoman Kim Hanemann, senior vice president - delivery projects and construction at PSE&G and Children’s Specialized Hospital Foundation trustee, was instrumental in leading the event committee to yet another record-setting year. Todd Pettengill and Jayde Donovan from the 95.5 PLJ Todd and Jayde in The Morning joined the festivities as the 2016 Honorary Chairs and helped give out the top fundraising awards. Corporate sponsors were an instrumental part of the event’s success. Special thanks to presenting sponsor PSEG and additional sponsors: IEW Construction, NJM Insurance, Open Road, Furino & Sons, J Fletcher Creamer, Burns & McDonnell, Ferreira Construction Co Inc. and Haugland family Foundation. These local businesses donated products for the event: Mr Cupcakes, Unos Pizzeria, Snapple and JBL Electric who provided the water. For more information or to donate, visit childrens-specialized.org/walknroll.